Since being tipped for the top by Jazzwise magazine, Sue Richardson’s career has gone from strength to strength. Her most recent album, Too Cool, The Life & Music of Chet Baker, cemented her position in the jazz world – gaining four and five star reviews in the jazz press as well as internationally and sell out gigs at Ronnie Scott’s. It was also in The Sunday Times 100 Best Records of The Year 2013 - “The trumpeter and singer Sue Richardson’s homage to Chet Baker brings the boy wonder back to life”. 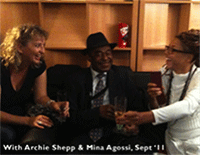 In 2012 Sue worked in Paris with French singer Mina Agossi and Archie Shepp on the blues project ‘Red Eyes’. Archie, on hearing Sue’s playing for the first time, commented “She can sure growl!”Recently Sue has been performing with Ian Shaw (she guested on his current album dedicated to the work of Fran Landesman) and they performed a sold-out duo show of jazz standards bringing together all elements of their talents. Touring with big bands by the age of 16, Sue’s musical journey has seen her gigging in over 50 countries in hotels, jazz clubs and on cruise ships. You can even hear her recorded version of The Girl From Ipanema being played in Rio in the famous bar where the song was written. She has worked for the BBC, performing at The Last Night of The Proms and gaining a Blue Peter badge for her singing! Sue’s gigs are a great combination of her original songs and imaginatively reworked standards, revealing her love of mainstream and 1950s jazz. The musicians in the band also take centre stage with well thought-out solo spots. The tightly-knit band have taken their special brand of modern jazz with a main stream twist to many venues on the national and international circuits.